For any business to succeed over the long haul, transformation is inevitable. Such is the case with the Willow Lawn shopping district. It has seen six decades of reinvention and renovation since it opened as Richmond’s first shopping mall in 1956 when G.C. Murphy and Woolworth were anchor stores and Eisenhower was president. Since then, businesses have come and gone, and the space has vacillated between open air and closed in – and states in between. The latest changes have returned The Shops at Willow Lawn to its original form. 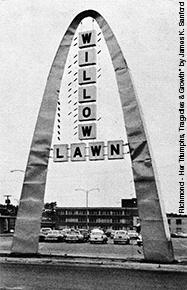 When Federal Realty Trust acquired the Willow Lawn Shopping Center in 1986, they enclosed it and changed the name to convey the new and modern improvements. It became The Shops at Willow Lawn. In 2011, the mall would once again be remodeled. Local architecture firm Baskervill was commissioned to return the mall to its original, open-air state. The majority of the $9 million renovation was completed in 2012, and the new design includes a community area, new landscaping and lighting, better visibility from Broad Street and 17,000 square feet of new tenant space. This summer, there are more property improvements planned for the plaza and walkways — all of which will further improve the pedestrian experience and provide greater connectivity. The Shops are currently 92% leased and there’s approximately 30,000 square feet targeted toward a future merchandise plan. Read more. Iconic stores have long anchored the original center, including Giant Food, JCPenney, Peoples Drug and Safeway. Older Richmonders remember catching a bite to eat at the S&W Cafeteria and indulging in sweet treats at High’s Ice Cream or the Fanny Farmer candy store. Over the years, these stores of a bygone era would eventually give way to contemporary retailers like Old Navy, Bath & Body Works, Panera Bread, Starbucks and Kroger. And the new wave of business keeps coming. This year, two new restaurants will open: Zoës Kitchen and Travinia Italian Kitchen & Wine Bar. “Both of these restaurants, as well as American Tap Room, chose Willow Lawn as their entry point into the Richmond market. Kroger has just opened a gas station, which brings new meaning to the concept of one-stop shopping,” says McBride. 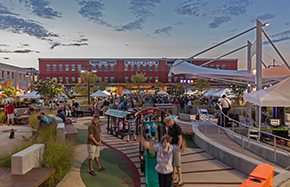 Today, more than 60 shops and restaurants – along with plenty of parking spaces – are a welcome respite for the 250,000 people who live within a 5-mile radius of Willow Lawn. On top of all of this, the center is home to The Children’s Theatre of Virginia, which hosts live entertainment for more than 30,000 attendees every year. There’s also a children’s play and entertainment plaza, and The Shop’s outdoor programming features a craft beer festival in the spring and the third annual Wine & Whiskers event in August. “We take pride in being a part of the Richmond community and partner with local charities for all these events,” says McBride. *Source: Federal Realty, Feb. 2014. Get the latest news about doing business in Henrico. Thank you! Your email address has been successfully added to our monthly e-newsletter.